Utagawa Kunisada/Toyokuni III (1786-1865) Okabe Rokuyata Tadazumi in Combat with Satsuma no Kami Tadonori at the Battle of Ichinotani, c 1820. Oban. This is an important print, very rare and something that almost never comes onto the market. Kunisada was the most prolific of all the ukiyo artists yet despite his output, only a handful of true warrior prints are known to exist. Horst Graebner’s catalogue raisonné lists only 50 in total from throughout his career. That this print is from the early 1820’s adds to the rarity and also the academic importance of the piece. 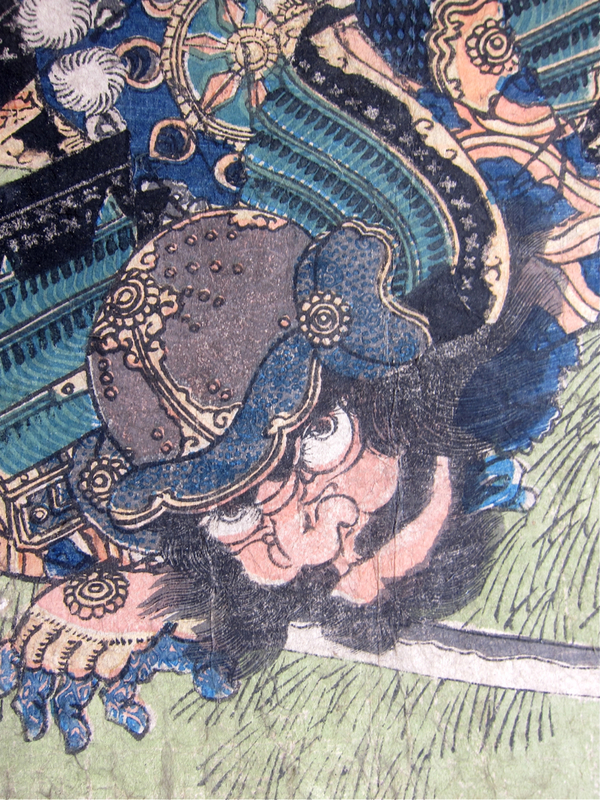 Kuniyoshi became famous for his ‘innovation’ of the single sheet oban musha-e with the publication of his 108 Heroes of the Popular Suikoden in 1827. At the time, Kunisada was already a prosperous artist whilst Kuniyoshi had resorted to selling tatami mats to make ends meet. 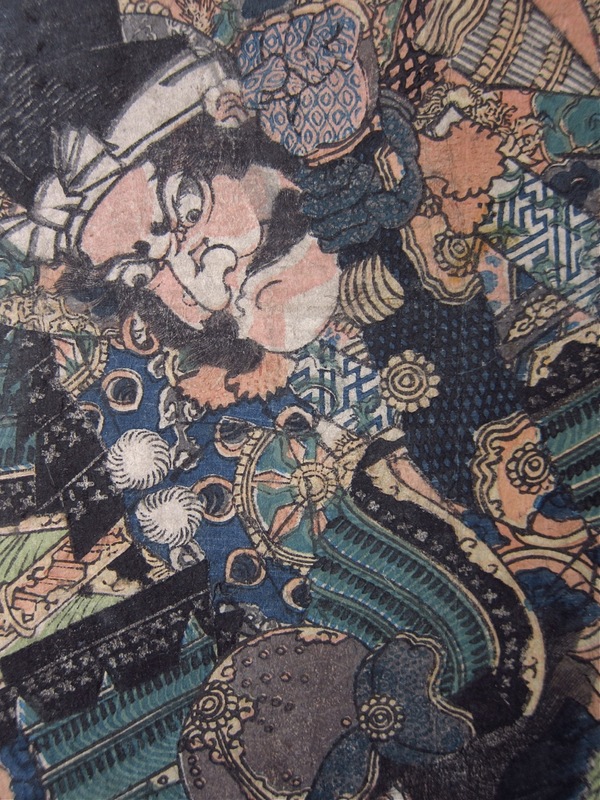 When the opportunity arose, it is inconceivable that Kuniyoshi did not use the few prints from Kunisada’s earlier series as the model for what was to become one of the most celebrated series of warrior prints. The complexity of influence does not end there since Kunisada altered his habitual Utagawa School style and adopted a drawing style from another contemporary - Shuntei Katsukawa. The print depicts a scene from the most famous battle of the Genpei Wars, the attack on Ichinotani of 1184. 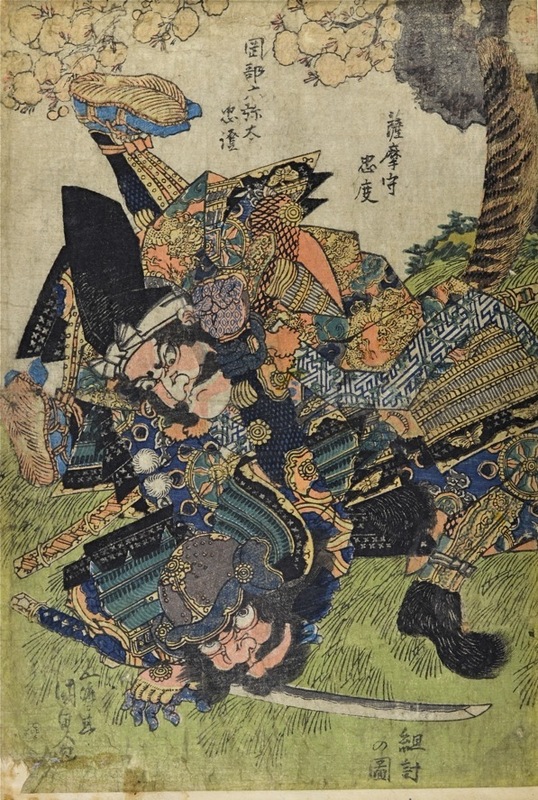 Two of the combatants are engaged in a struggle; the man on the ground is the noted warrior poet Satsuma no Kami Tadonori (also known as Taira no Tadonori). The other figure is Okabe Rokuyata Tadazumi. Tadonori is one of the great tragic figures of Japanese history, demonstrating the sadness and futility of war. He features in many stories and prints and it is said that he was identified at the site of his death by a poem attached to his quiver predicting his own fate. Dark barring my way, / a tree’s sheltering boughs / shall be my inn: / this night let blossoms / be my host! We are aware of only one other copy of this print in existence, that copy being of similar quality, trimmed to the image but with surface wear to the very fibrous paper. The impression and colour are good but there is damage to the lower left corner of the sheet, overall fair condition. Signed Gototei Kunisada ga; published by Kawaguchiya Uhei; kiwame censor seal.